Meghan Markle, 37, announced she was expecting her first child with husband Prince Harry, 34, ahead of her first major overseas tour last month. Kensington Palace revealed the Duchess of Sussex’s due date is in Spring 2019. Meghan wore stylish trench coats, chunky knitwear, plus tuxedo and midi dresses from Australian and favourite designers as she adapted her wardrobe to the first few months of pregnancy. But like many pregnant women, Meghan Markle will have to determine what style works best for her and her growing bump. Thankfully, she has royal sister-in-law, Kate, Duchess of Cambridge, on hand to help. 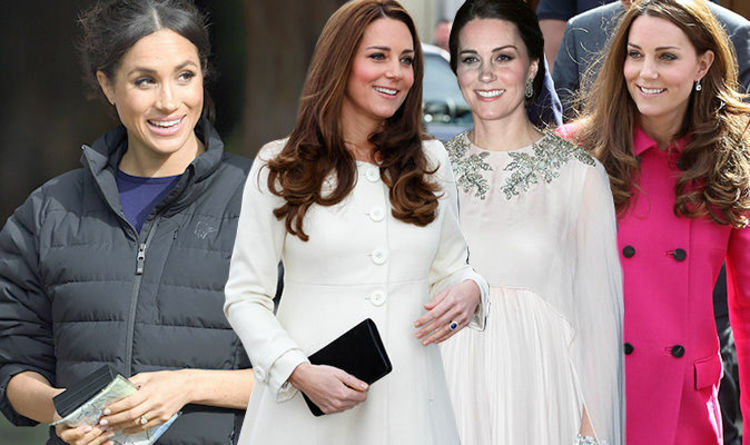 Kate maintained a polished style throughout her three pregnancies with Prince George, Princess Charlotte and Prince Louis – will Meghan favour the same? One fashion blogger has told Express.co.uk the answer is no. According to Meghan’s Mirror, the fashion blog dedicated to Meghan’s fashion trends, the Californian Duchess “couldn’t be more different” from Berkshire-born Kate when it comes to sartorial choices. Christine Ross, from the style website, said: “Meghan and Kate have very different tastes in fashion. “Meghan’s maternity style will really stay true to the elegant, clean lines and simple cuts that she has always preferred, but allowing extra room through tailoring as her body changes. While Meghan and Kate both embrace strong tailoring, Christine says “Meghan loves a modern, urban style whereas Kate loves her country look”. She added: “They really couldn’t be more different, so it is very difficult to compare. What can we expect from Meghan’s maternity wear? Do not expect to see the Duchess of Sussex trying out bold new looks over the next few months, is the fashion advice from Ms Ross. She said: “We expect Meghan will stay true to her personal style, preferring lots of neutral tones, clean cuts, and geometric details in her fashion, even as her pregnancy progresses. But what we can expect to see from the Duchess are “comfy black trousers” paired with simple sweaters, blouses and oversized coats. Meghan is also likely to celebrate some high street maternity styles, such as Seraphine Maternity and ASOS, along with her favoured brands. We can also expect to see the duchess wear J. Crew and Madewell, as well as her go-to designers Stella McCartney and Givenchy.